A team of researchers supported in part by the NASA Astrobiology Program has turned to acupuncture in order to study samples from rough and uneven surfaces, such as rocks and meteorites. Using the technique, scientists at the Center for Chemical Evolution (CCE) at Georgia Tech have developed a robotic system that can collect samples from these non-planar surfaces. The system uses a 3-D camera mounted on a robotic arm to map the irregular surface of an object. Then an acupuncture needle pokes and probes a tiny spot selected by the scientists. A minuscule amount of material is collected at the tip of the needle and carried by the robotic arm to a mass spectrometer. The system allows scientists to specifically 'pinpoint' the exact region of a rough and irregularly shaped object for sampling. The mass spectrometer then provides detailed information about the sample's chemical composition. The technology could have many applications for astrobiologists, and the team hopes to use it for studies on the origins of life. The inspiration for the study came from examining fine-scale details on the surface of meteorites. Life's origins on Earth are thought to have occurred when small, simple molecules interacted with one another to form larger and larger molecules. Eventually, the components necessary for life, such as genetic material and structural molecules, became incorporated into the first living cells on Earth. Understanding how and where these ancient reactions occurred is a fundamental goal of astrobiology. Some scientists believe that these first reactions could have been jump-started by minerals on the surface of meteorites. However, directly studying the surface of meteorites at such a fine scale is difficult because the surface is not flat. Meteorites are rough and uneven, and are covered with pores, cracks and fissures. The instrument helps solve the problem of collecting tiny, specific samples from the surface. 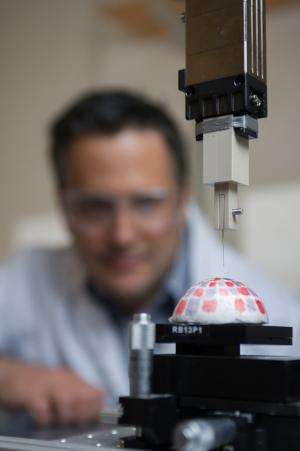 Ultimately, it will allow scientists to collect samples from the exact areas of a surface where reactions are occurring. The team hopes to simulate origin of life reactions on rocks and meteorites in the lab. 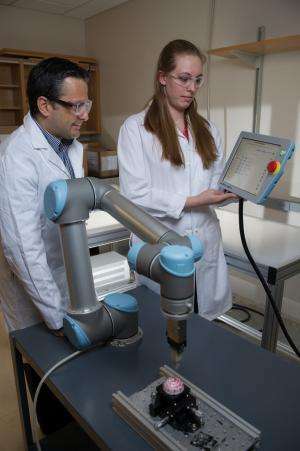 Using their robotic acupuncturist, they will able to collect tiny samples of the reaction products from the surface of the objects in order to study them in detail. The team has not performed these experiments yet, but according to Facundo M. Fernandez of the School of Chemistry and Biochemistry at Georgia Tech, this is where their work is headed. For now, they are exploring ways to improve the resolution of the technique. This includes upgrading the mass spectrometer and improving the 3D vision system and software. "With these improvements, we hope to have a system that is competitive from the performance point of view to image such reactions on minerals," says Fernandez. "We are particularly interested in phosphorylation reactions by the mineral schreibersite on organic substrates, work that we are carrying out in collaboration with Professor Matt Pasek and other CCE principal investigators." Fernandez and his team will be working with other CCE Principal Investigators, including Matt Pasek of the University of Southern Florida, to study how meteorites react with organics. "Since meteorites are not planar surfaces, even when cut, the reaction of a meteorite with an organic substrate could generate mineral-specific compounds at the surface of the meteorite," says Pasek. "Trying to figure out what these are on these 3D objects could definitely benefit from that analysis." In particular, Pasek and Fernandez will look at phosphorylation or organic substrates by the mineral schreibersite. Phosphorylation reactions occur when a phosphate group is added to an organic molecule. One reason that these reactions are vital for life is because the addition of a phosphate group turns many enzymes in cells 'on' and 'off.' When an enzyme is turned on, it takes an active role in cellular processes that are essential for keeping our cells alive and working. Schreibersite is a rare mineral on Earth, and one of the only places to find it is in iron-nickel meteorites that fell to our planet from space. Studying schreibersite's role in reactions important to life could help astrobiologists determine if materials delivered by meteorites were critical for the origin of life as we know it. The new robotic system will be incredibly useful in studying meteorites, but it also has numerous applications beyond studies on the origin of life, including fields unrelated to astrobiology. There are many fields that can benefit from studying molecular interactions on a 3-D surface. "One idea would be the investigation of suspicious skin lesions on ears or other areas of the body to establish their malignancy," says Fernandez. "Another application would be the automated screening of explosives/narcotics on the surface of luggage, where the robot takes a swab sample of the surface of a luggage piece passing by on a conveyor belt. It could even be useful for looking at a growing organism (such as a plant) or even a 3D cell culture." In terms of space exploration, the system could inspire instruments for robotic explorers on other worlds. 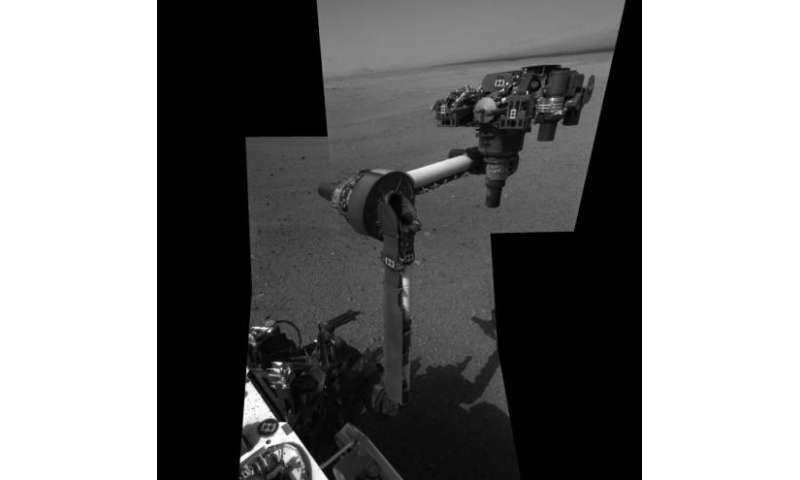 Rather than scooping up a sample of soil, rovers or landers could perform this special form of acupuncture on rocks or other targets of scientific interest while exploring the surface of planets like Mars. "[The system] could have an application in examining complex rocks from various angles and under situations which may be not ideal for taking a sample by drilling," says Fernandez. "The opportunities are endless."